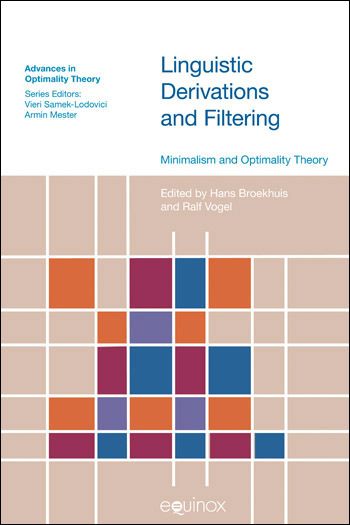 This volume focuses on the role of the postulated derivational and filtering devices in current linguistic theory. It promotes the exchange of ideas between the proponents of Chomsky’s Minimalist Program and Prince and Smolensky’s Optimality Theory to evaluate the role of these devices in the two frameworks. It discusses the tenability of the often proclaimed opinion that the Minimalist Program and Optimality Theory are incompatible frameworks, given that the explanatory power of the former mainly resides on the generative device, whereas the explanatory power of the latter mainly resides in the filtering device. The papers presented here discuss and compare the two devices in these two frameworks from various perspectives, collating a number of arguments that favour a strictly derivational, a strictly filtering, or a hybrid approach. This book is directed to syntacticians working within the current frameworks that have developed from the Minimalist Program and Optimality Theory, but it will also be of interest to researchers or advanced students of linguistic theory.